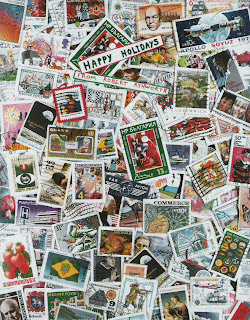 Christmas card I made back in the 1980s from throwing a bunch of cancelled stamps onto a photocopy machine. Back in the 1970s, my mom had a jug of stamps that she kept for some project at the church. She didn't mind if I grabbed a few. Then I did quite a bit of international correspondence with part of a loose network of artists in the mail. This type of correspondence is often called Mail Art, or in some cases "CorresponDANCING."